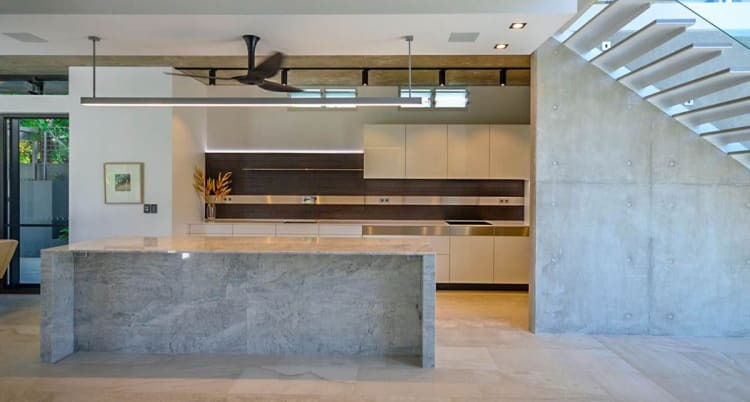 For this dramatic yet minimalist kitchen, the owners asked Pepper Design to create a kitchen befitting their architectural home overlooking a sprawling golf course. The owners fell in love with the +Artesio concept from Poggenpohl, so it was up to Pepper Design to blend it into a minimalist space, says architect David Kane. Despite the clean, sculptural aesthetic, attention to fine detail on the design was all-important. For example, the corner bench seat and table match the finish of the kitchen. Even the stitching on the leather seats was measured to run in 130mm increments to match the measurements of the panelled wall. The marble wrapping the island was selected by the homeowners and this organic-look material is an important part of the material composition and impact of the kitchen.